My husband works on the other side of our "studio" which is only a small room about 10 x 11 feet. If he rolls his chair back when I roll my chair back, we crash, that's how small our space is, but we still manage to do our things. He makes wood, model boats and frankly, between quilts and boats, we are running out of space. 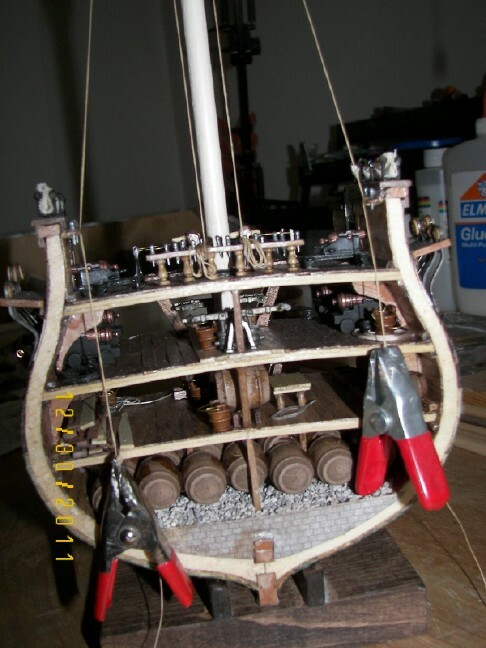 This project is USS Constitution, "Old Ironsides", circa 1700, a war ship and this is a crosswise cross section. The mast goes up another 2 levels, but he decided this was tall enough. DH is a big man, large hands and I truly do NOT know know he can fiddle with all the lines, tiny knots, drilling teeny things, etc. In this case, he cannot even rest his hand on anything when his hands have to be 18 inches over the tablle. There are a LOT of words that come out of his mouth at times -- then I have to leave the area! Those clamps are helping to hold knots tight, or glue or something. This is a cross wise section, and his detail is amazing! There are several decks on this ship, which would hold all the supplies for the crew. 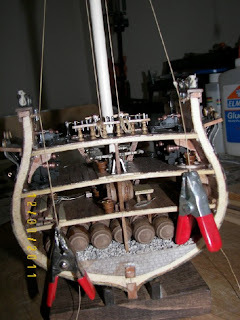 This one starts as a kit, with the basics, and instructions are frequently in another language and almost always, have serious errors, so all calculations and cutting have to be logically challenged - you just cannot dump the parts out on the table - you have to KNOW how boats/ships are built. He's really good at adding or inventing the details that bring it to life, as well as "making do" when something goes awry. Below is a close-up. So far, he's put in 150 hours, and there are many more to go. Your quilt looks great. The machine quilting is very nice! I like the pattern you are quilting on your rebuilt log cabin. Yes, you are lucky those pleats aren't obvious. Your DH's ship is amazing. The best thing is he has something that keeps him occupied in retirement. You COULD use a larger studio though. I know people who use the master bedroom as a studio and sleep in one of the smaller rooms. After all, how much room do you need to sleep and change clothes? I am glad the quilting worked out well on your quilt. I won't tell your secret! DH's ship is awesome. I agree, I don't know how anyone can do those small, intricate things. I have lost some dexterity in my hands as I have aged. I know what you mean about running out of room! LOL! Happy New Year. 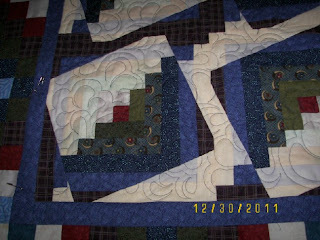 The quilting is great on this piece. I love that boat so much detail. I work in Boston and can see the Constitution from my office. It's one of my favorite tourist sites here in the city. Your husband is doing an amazing job! Have you guys been here to see the actual ship?